Every season, my hair decides to reject every go-to product i’ve been using and I have to find a completely different routine with completely different products! It’s an annoying (and expensive) process! But, I seem to have found a routine that my hair is in LOVE with, for the moment anyways. This routine has my twist-outs and wash & gos shiny, moisturized and – my favorite part of all – elongated! The shrinkage is always real, but these products seem to help eliminate the shrinkage and retain some length. Wash hair with the Sweet Ginger Rinse. I LOVE this rinse. I’ve been using it for a long time now, actually. It’s made with castor & aniseed oil, is sulfate free, and smells great. I’m not even going to lie to you, this shampoo is pretty expensive. But it’s worth every pretty penny. After rinsing hair, apply Leave-In Condish and then detangle using a wide tooth comb. This leave-in conditioner provides great slick and makes it very easy to detangle my hair. Part hair into 4 sections, and apply coconut oil to each section. Comb through each section. Now I switch back and forth between coconut oil and jojoba oil. To be honest, I had to stop using coconut oil for a long time. I felt like it was just sitting on top of my hair and eventually felt like it wasn’t moisturizing my hair AT ALL, so I had to let it go all Fall and all Winter. I decided to just try my luck and go back to it, and it felt like a whole new product! So i’d say, if you’re one of those people on the fritz about coconut oil, take a break from it for at least 6 months or so and then give it a try. But jojoba oil has always held me down as an alternative! Use the Coil, Kink and Curl styling cream with Eco Styler to style as desired. 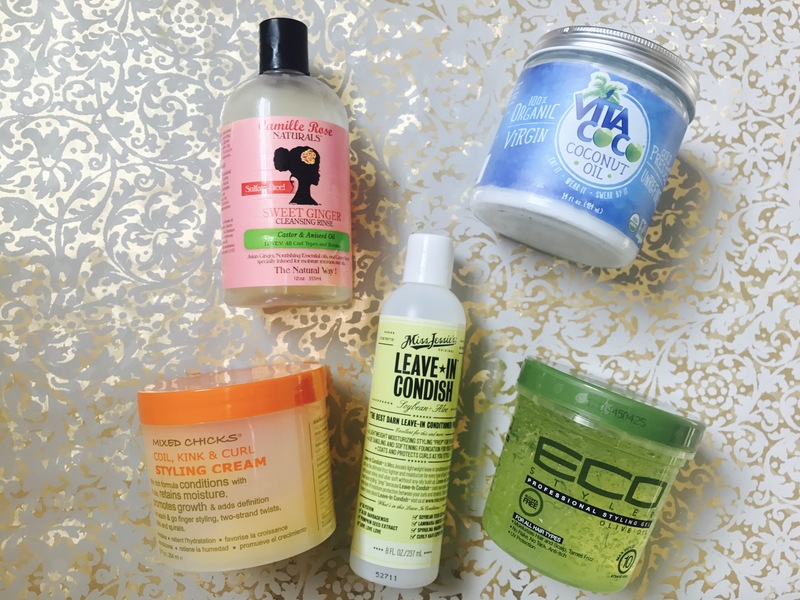 Like I mentioned above, I use these products for both wash and go’s and twist outs. I apply the cream first and then go back with the gel for wash and go’s. With twist-outs, I apply a good amount of styling cream to the hair, comb through, and then apply a small amount of eco styler right before I start twisting. The cream makes/keeps it soft and defined, while the eco styler fights against the humidity and my hair doesn’t get too poofy and frizzy. What products work for you in the heat and humidity? Let me know in the comments below!